Have you ever wondered what mech-versus-mech combat would be like if it were boiled down into a competitive tabletop game featuring programming, deckbuilding and hand-management mechanics, as well as wildly varied player abilities? That’s exactly the question that Critical Mass sets out to achieve. 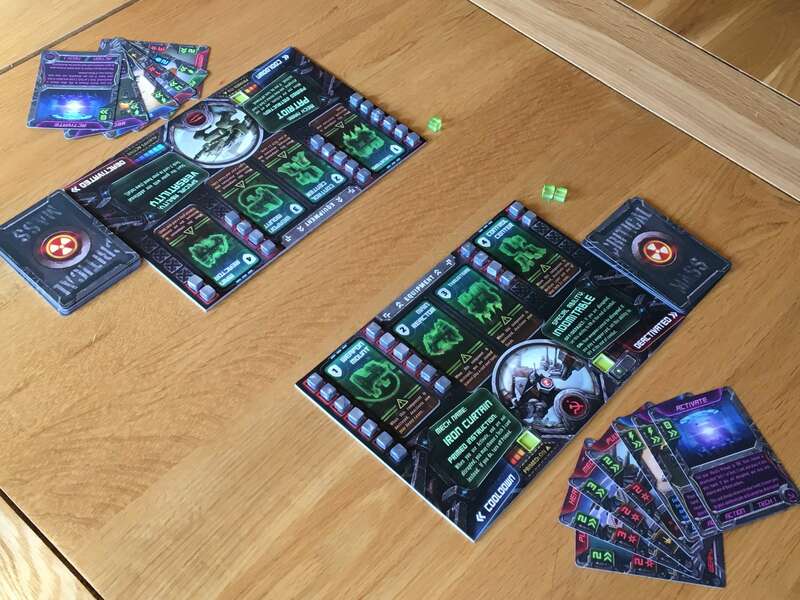 A recent release from Arcane Wonders, Critical Mass was developed in collaboration with Tom Vasel and The Dice Tower as part of an ‘Essentials’ range, which has a specific focus on creating accessible, exciting games. At the time of writing, Critical Mass comes in two flavours, each of which allows for a two-versus-two experience based on each player taking control of one, specific mech. The two starter packs are Patriot vs Iron Curtain and Raijin vs Archon; by combining the two sets, it becomes possible to play Critical Mass with up to four players. Changing from duel to multiplayer mode is as simple as introducing another deck of cards to indicate which opponent will be the intended target for attacks based on their position at the table. Having played both modes quite exhaustively, I have to say that I prefer the purity of the duel mode, but I agree that there is a place for the organised chaos of three- and four-player games all the same. A large part of why I’ve formed this opinion is because of Critical Mass’ core gameplay, which is based around selecting cards and placing them face down, then resolving the fastest of them first. This can be quite a focused, strategic dance during a duel, but in multiplayer, the added complexity of multiple opponents changes the pace quite a bit. 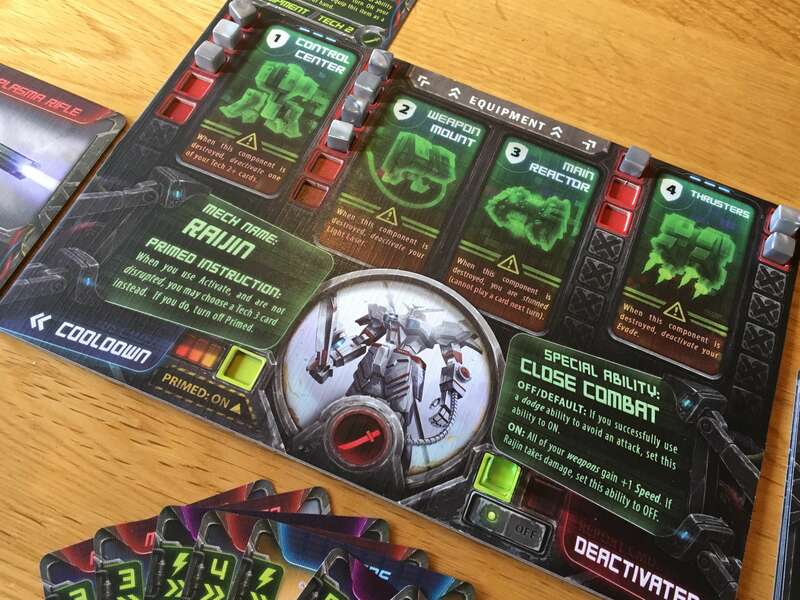 In addition to using cards to program the action of each mech and the order of priority, there’s also an element of deckbuilding in Critical Mass. 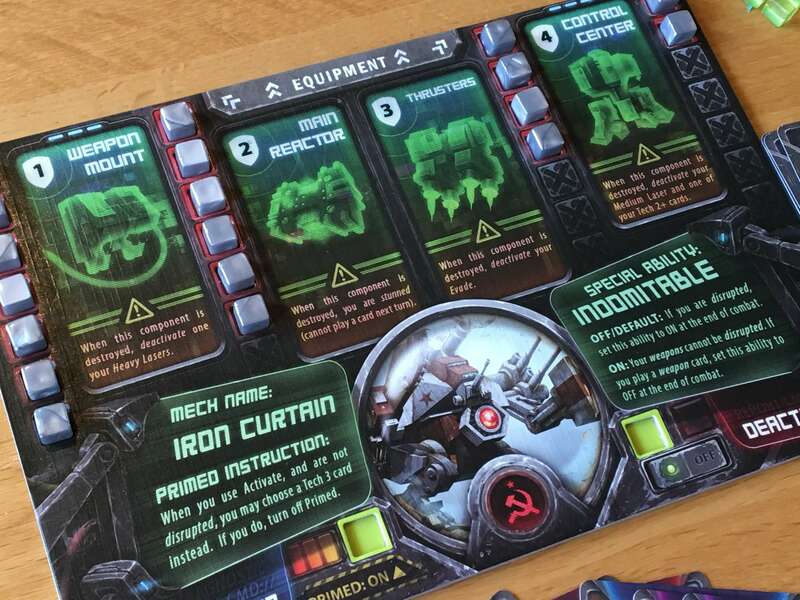 Each mech does have a pre-defined loadout and a set of recommended cards, but realistically, players can build out their deck however they like. From the selection of cards that they do choose, only certain weapons and abilities will be active at the beginning of the battle. As certain cards are used, other weapons can be charged and brought online, which gives players the choice between going for the jugular with their starting weapons or focusing on evading, defending and powering up. Each mech has its own cockpit board that will come with an array of wooden cubes nestled within it to show the status of various systems. Each system can be targeted by enemies, with the result being that if a system is knocked completely out of commission, it can be disabled entirely — which will likely come with some penalty such as having to deactivate a particular weapon or ability card. Whilst the mechs are fairly finely balanced, they are all different and as such, each has different strengths and weaknesses when it comes to protecting themselves. Although I’ll go into more detail later, I should mention that resolving combat is quite straightforward — it’s based on the speed of the attack and its power level compared against the armour value of the targeted area. Some cards can reduce or counter attacks, so there’s another fine balance here between going all out for fast but weak attacks or preparing to take some damage in return for potentially being able to land a killer blow. Critical Mass has a very straightforward set of components, each of which is built to a high standard. Each game has a deck of cards that depict the various weapons and abilities and the information on these cards is clearly represented and accessible. I dare say that the card art isn’t the most engaging I’ve ever seen, but it does the job well enough and fits in with the box and cockpit card art nicely. There’s certainly no shortage of cards and the options available to players do allow for various different tactics. The mech cockpit cards are excellent. As I mentioned before, each one is unique to the mech it represents and the production value is close to flawless. The boards are all double thickness, with a top layer that has perfectly sized cutout spaces for tracking charge levels and armour on each of several individual tracks. Each board looks great, but they also feel satisfying to play with — even the armour cubes are painted in silver to represent chunks of steel. Taking them off the board feels like having chunks blasted from your mech. The manual is clear and attractive, with a good layout that walks the players through each phase of the game. During my first play, I did slightly struggle to interpret a couple of the rules around tech and deck building etc., but upon re-reading the manual more recently, I don’t think that was anything other than my own lack of familiarity with the structure of Critical Mass. Overall, I really like the presentation of Critical Mass at a component level and the fact that there’s a quality feel to everything really enhances the play. Perhaps the art could pop a bit more, but in contrast to that opinion, I can appreciate the ‘serious’ mech warfare angle that Arcane Wonders has chosen to focus on. 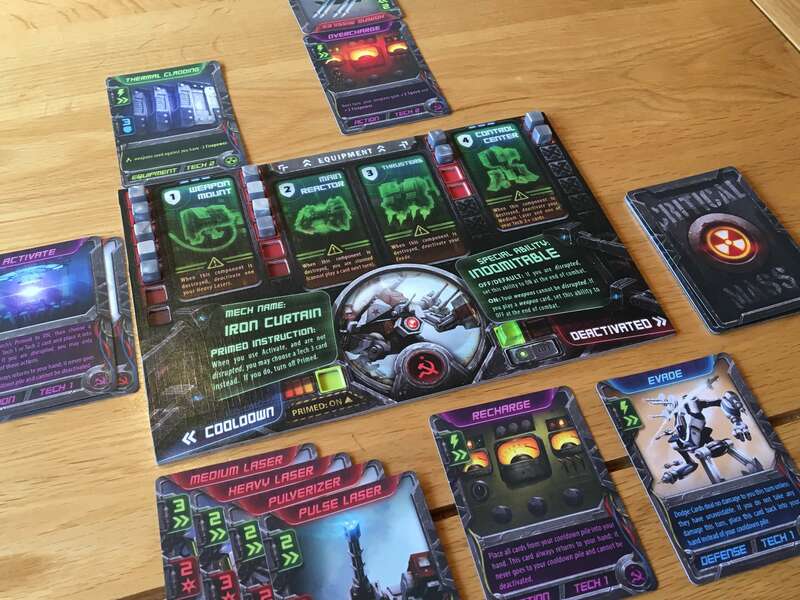 Whilst it took me a little bit of time to get to grips with the setup of Critical Mass (since deck building is as big and important a part of the game as the actual playing), turns actually flow quickly and smoothly. The players will always choose their card for the turn and place it face down simultaneously, with the only exception being cards with lightning bolt on them, which resolve immediately before all other cards (or simultaneously if more than one is played among the players). After these instant cards, each card is resolved one by one beginning with the fastest. Cards will sometimes be focused on attacking the opponent directly, whilst others allow a player to evade or defend against a big attack, usually with some other benefit that comes in at the end of the round, such as being able to prepare another card or prime their mech. Cards like Overcharge, for example, allow the player to simply increase the speed and strength of their next attack, but do nothing on turn on which they are played. Once the actual combat (if any) is resolved, then after-combat effects such as activating new weapons will be performed, then a cleanup phase occurs. This usually just involves adding the cards that were used to the cooldown pile, but cards like Recharge allow the player to reshuffle their cooldown pile in preparation for the next round. How complex (or not) a turn in Critical Mass will be is generally down to the cards played either this round or in the previous one. There are certainly some combinations to build and players can customise their decks to have a specific focus, but I can’t think of any combinations that are complex to the extent of a game like Magic: The Gathering, for example. When playing with newer players, I’ve simply found that the best option is to use the predefined decks, especially since that shortens the overall game length by about a third, on average. Ultimately, any mech that has its critical systems destroyed will lose the game, so trading damage is essential. The fact that different systems have different amounts of armour actually means that it’s rare for players to be able to simply focus all fire onto one in order to take it out early. That can happen with certain card combinations, but more often than not you’ll need to chip away at various systems one by one. As the penalties for losing systems begin to mount up, mechs can go from being relatively stable to utterly defeated in a short amount of time. My experience with Critical Mass has been excellent, and it’s certainly a game that I am keen to bring out whenever I have the chance. I like the deckbuilding element personally, but I do appreciate that not everyone does, so its excellent that Critical Mass gives players the option of playing it in either the full-fat version or simply as a versus game using a balanced setup. Either way, it’s fairly quick to teach and has neither fiddly nor nonsensical rules, meaning that it almost guides players through each round based on simple common sense. In duel mode, I really like that players can customise decks specifically to deal with the kind of setup they think their opponent will go for and specialise, whilst in multiplayer, I’ve found that there’s more of a need for generalisation. 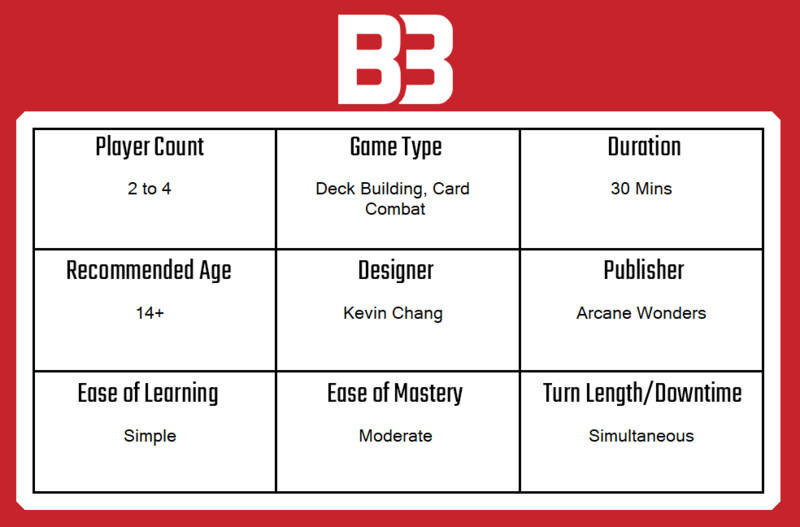 When using the full deck-building approach for a four-player game, one of the most fun things I introduced with experienced players was a kind of draft mode, since the vast majority of the cards used to build decks are common (i.e. not specific to one mech or another.) This felt like the most unpredictable and exciting way to play Critical Mass, although it’s definitely not where I would start a beginner from. Whatever mode you choose to play it in, Critical Mass delivers a satisfying experience. There are luck- and judgement-based elements to choosing which cards to play when, but ultimately the fact that you built your own deck and made meaningful choices about when to play cards removes any feeling of bad luck or being out of control. Whilst it might seem like the game can be quite long at first (especially with deck building) it actually gets faster as more and more damage is taken, meaning that any game will be over within an hour, usually. With a unique take on mech versus mech combat that is already expandable (and no doubt more boxes will come in the future), I really like Critical Mass. It feels a lot like a card-driven version of classic mech-centric games like Mechwarrior and Battletech, but with its own unique take on mech creation. I like how it uses different tech level cards for each mech to maintain balance without introducing too much complexity to remember and I love how individual mechs can feel once built up. Obviously, tearing down the mechs of your opponents is where the fun really lies and that is also where Critical Mass shines. It’s simple to learn, engaging to play throughout and there is little downtime. The quality of the components weighed against the low price point also represent a big plus, since you could theoretically give Critical Mass a try and not be too disappointed if you didn’t enjoy it. With that said, I can’t actually see that many people who have an interest in the theme would be put off by any aspect of gameplay. Since I am a mech fan, this one is going on my long-term-keeps shelf, for sure! A copy of Critical Mass was provided for review purposes. You can find out more about it on the website of publisher Arcane Wonders.